Shown here is an example of the India pattern printed in blue without any added colors. It has an impressed "Spode" mark and the rare blue printed mark shown below. 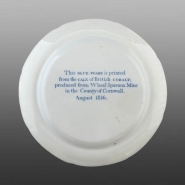 Printed on the back of this example, in addition to an impressed "Spode" mark, is the following inscription: "This BLUE WARE is printed from the CALX of British COBALT reproduced from Sparnon Mine in the County of Cornwall August 1816". The mine was near Redruth in Cornwall and the vein of cobalt was discovered there in 1807 and was later widely used by the Staffordshire potters. 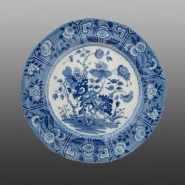 An indented pearlware plate printed in blue and colored in underglaze in the India pattern with overglaze enameling. This pattern was designed after a Chinese pattern from the K'ang Hsi period, 1700-22. In the early 1800s the name "India" was often used to describe oriental style.